Want the perfect gift for that special Rolling Stones fan who has everything? This is it!! It's a one-of-a-kind, handcrafted piece of art created using vintage license plates that tells the Stones amazing story. This custom guitar wall art is the perfect gift for the music lover in your life. Order this gift for the Rolling Stones fan in your life. When i created my ArtPrize entry I knew I would have some really tough competition. That’s why it was such an honor to see my exhibit included among the top 25 in the 3D category. I wanted to create a piece that would bring people together so I started with the subject of music. I think everyone loves music on some level. My medium is license plates. I love the reflective qualities they bring to every piece. So i mixed the two around America’s music history. What came I describe as a head-on collision between American Pickers and Rock and Roll history. 50 Music Greats from 50 State is a fun exhibit with lots of parts. First i point out the similarities between the license plates and music artists. They both travel the road extensively. They are iconically recognizable. You would be able to spot your home tag a mile away or a famous artist if you saw them out and about. Several of the artists have seen the inside of a jail. Johnny Cash’s first hit and most famous live recording was about Folsom Prison. And this is where license plates are made. The next part of my exhibit involves your cell phone. When someone takes two pictures of the exhibit — once without your flash and one with your flash - the exhibit reveals a surprise. Using the flash results lights up the license plates’ reflective qualities, and results in a reflective negative image. This is a true reflection of music history. The last part of the exhibit takes place on my website, where I provide Details about each guitar sculpture. i explain why I selected the artist to represent each state, and how many tags it took to create the piece. Since this exhibit was created for ArtPrize 10 in Grand Rapids, MI. I used a small piece of a Michigan tag in each of the 50 pieces. You’ll discover where the hidden Michigan tag is located by reading the details for each license plate guitar sculpture. I’ve come to realize that my license plate art exhibit at Rockwell Republic is like a head-on collision between American Pickers and rock n roll history. View my license plate guitar art exhibit at Rockwell Republic in Grand Rapids, part of ArtPrize10. Vote 67365. 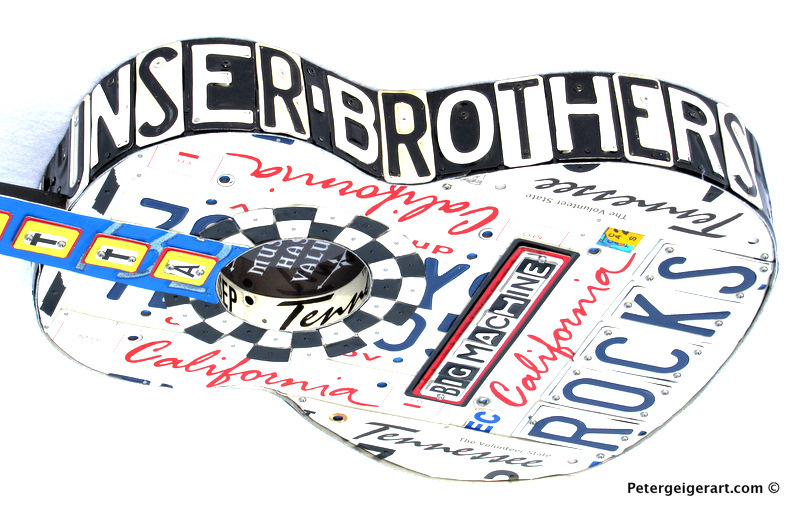 A license plate guitar for Kenny Chesney, commissioned by a “No Shoes Nation” fan. My guitar art graces the walls of the Anthem on Ashley, a funky new apartment complex in Atlanta's Old Fourth Ward neighborhood. This past weekend, I sold my license plate wall art at the Dogwood Festival in Atlanta's Piedmont Park. I met so many people who inspired me to come home and create new artwork featuring their favorite music artists. This personalized Christmas gift is created from license plate. 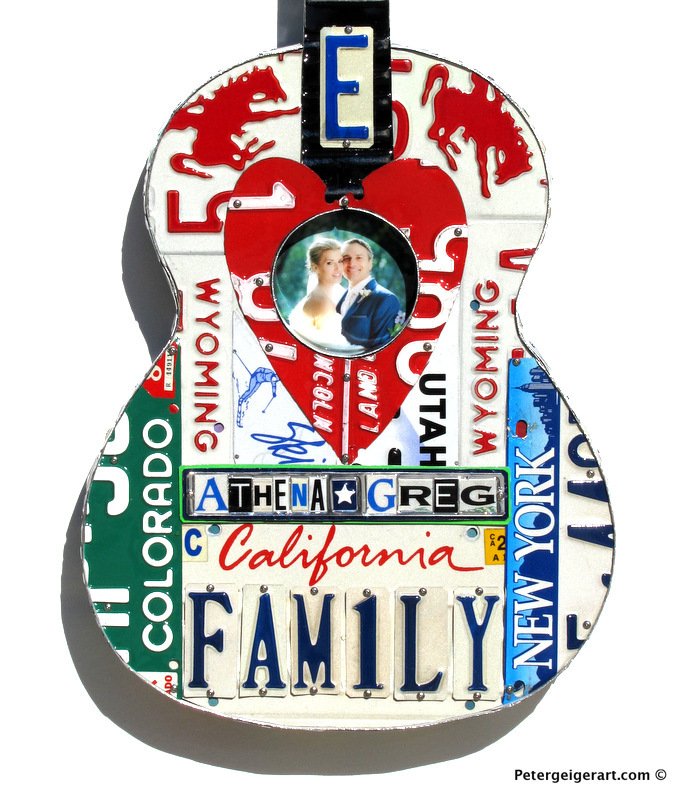 The wall decor is a sculpture in the shape of a guitar that tells the story of the family that commissioned Peter Geiger to create the artwork. I have created many wedding gifts this year, seems to be an upward trend. Weddings are a special time and if you have a special friendship you need a special gift that stands out. That's especially true when you're trying to give a gift to a couple that seems to have everything. Like most people in need of something, my client headed to Google when he was searching for a unique wedding gift, and found me on the Internet. The California gentleman asked me to create a personalized wedding gift for this special couple. He wanted to incorporate all the things they love and places they've lived. He wanted his gift to memorable and hold a special place in their heart. We nailed down most of the details during our phone interview. We decided to feature a photo of the couple in the center of the guitar. He emailed me a few to work with. The image worked so well as the highlight of the artwork that it left me speechless. It's amazing how the couple's story can really come together in this medium. You can really see a reflection of their life together in the license plates. Are you looking to create a special, handcrafted, personalized gift for someone special? Email me or give me a call at 516-376-6499. Hope to hear from you. When people see my license plate art their wheels start turning. A lot of my clients are music lovers, and this is how they get to combine their love for music and art. They take their favorite song or band and mix it in with the things that they love to create a unique piece of wall art that speaks to them. Here's the wall art I created for one of my clients from Wisconsin who is a Pearl Jam lover. He asked me to combine his love for Pearl Jam and the Green Bay Packers to create this unique license plate artwork. One of his favorite songs is Release by Pearl Jam. I featured it down the neck of the guitar sculpture. On the bridge is a phrase from the song, "I'll ride the wave." The band members of Pearl Jam are from Washington so I used vintage Washington state license plates to create this piece. I placed the letters "PJ" around the body because Pearl Jam uses this as a symbol in most of their artwork. I mixed in the Green Bay Packer colors as spacers between the letters to highlight my client's love for the football team. The Stickman, a symbol immediately recognized by Pearl Jam fans, is prominently on display in the center hole. Let me know what you think of the piece in the comments. If you would like me to create a unique piece of art for your wall, drop me a line. I've found one of the most important aspects of being a good artist is being able to package your artwork for shipment. That is so important as much of my business is done on the internet. It's one thing to create a beautiful piece of artwork. It's quite another to make sure it gets to its destination safely and in the same shape I sent it out. Here's a little on my process. At the end of the day, I check my email; that's usually when I learn of orders that arrived on my internet doorstep. First thing the next morning, I'm out in my shop cutting and shaping cardboard to pack up the artwork for shipment. All of my shipping materials are recycled from car dealers. I happen to be a great dumpster diver. I'm lucky to have a few body shops in my area which are my go-to places for cardboard and bubble wrap. I've had a few different jobs over the years but by far this is the best one. I love this life and I wouldn't trade it for anything -- even if I have to jump in a dumpster once in a while. It's all for a good cause - and that is to make sure you get my artwork as I intend it to be. You learn something from everyone in life. From these people, I learned how to give back. Three years ago, I started helping Ray and Erin Evernham with their charity Ignite when Ray, a client, needed some artwork for his annual charity auction. He's a car guy from New Jersey with a racing background. My artwork has helped raise money for this important organization. It really makes me feel great to know that I can make a difference and help out. I created this piece for Erin and Ray when they recently celebrated their 8th wedding anniversary and Ray's 60th birthday. The license plate art represents their love of racing and the states they are from. They have two kids featured on the sides and a shamrock represents Erin's Irish heritage. It's a custom, personalized gift that represents a milestone and special occasion. Best wishes to this couple. My artwork is always about my clients and their lives. So when I get commissioned to create a unique gift for that special day -- in this case to celebrate a wedding -- it's always a reflection of the road the couple traveled. This custom wedding gift was ordered by the groom for his bride. The bride was in the US Air Force in Alaska and loves nature and all the wild life associated with that state. The groom has very a specific nickname for his bride, "My Angel," and requested that be featured prominently along with his favorite saying "I love you more." They were both originally born in North Carolina and wanted that mixed in but he requested that Alaska be front and center. He also said his wife had a tattoo of the Alaska flag and stars. I used the Alaska gold rush tags on the face because the blue used in the plate is a very close match to the US Air Force blue. The sides have the Carolina tags and the center is the bear for her love of wildlife. The top features their wedding date and the Alaska flag is just like her tattoo. The sides of the wedding gift feature the wedding song "Green Eyes" as well as the bride's birth date. I think their story has transformed well into a personalized piece of art, and you can see that in the final piece. Having my license plate guitar art featured nationally has been a great experience. partially because, thanks to social media, I get to see my license plate guitars on the walls of Red Robin restaurants around the country. Working with a commercial client like Red Robin is almost like having my own personal gallery across the United States. Clients come in to get food and then the experience my custom wall art. While they're waiting for their food to come, they take pictures of my artwork, share it with their friends and on their social media sites. 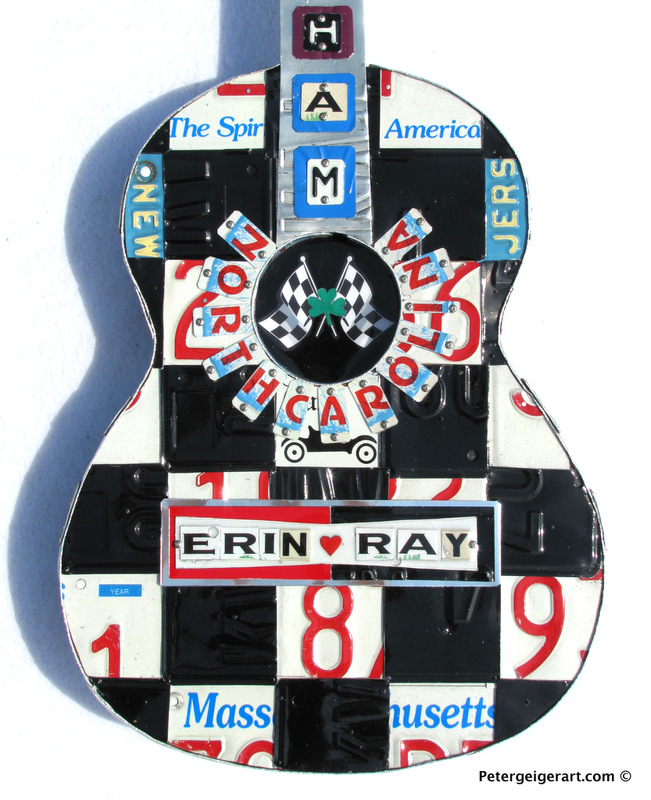 I have seen many pictures of my license plate guitar art on review sites such as Yelp, Trip Advisor and Google. Lucky for me, it makes it possible for clients to find me on the Internet. I appreciate my job every day. It's a great time to be an artist. Here are a few pictures that people have posted on reviews of the Red Robin restaurant chain. If you're in a Red Robin or see my guitar art elsewhere, post a picture and if you can, tag me. I'd love to see it. I do a lot of art shows around the East Coast, so it was a real nice change to be able to participate in Artsplosure right in Raleigh. It was fun to meet up with many previous clients, as well as folks who had seen articles or news clips about me from Our State Magazine, WRAL's Tar Heel Traveler, UNC-TV, or my story in Southern Living. It was like a homecoming, and I have to say I really enjoyed it. I also would like to thank all the new friends I made here this time. ABC 11 did a nice feature that included an interview with me, which resulted in more than a few people asking about my license plate art on Sunday. One of the pieces featured in above news clip is my Bruce Springsteen license plate art. The client who ended up purchasing the Bruce Springsteen piece was so happy with it that he sent me a photo of it in its new home. Thanks, Artsplosure and Raleigh, for another great art show. I would love to take credit for this piece but I have to give most of it to my client from Miami. First for requesting this amazing artist. She was so talented but left us to soon. She wanted her favorite Amy songs featured on the piece and we worked really hard on all the other details to make sure Amy could really come thru on the piece. I created a custom, handcrafted license plate art in the shape of a guitar for an Oklahoma realtor who loves his family, the OKC Thunder and OU football. I just returned from doing the St. Stephen's Art show in Coconut Grove Miami. The show was packed, and I met a lot of interesting people there. Hover, my most memorable experience was a client who came into my booth during the weekend, then called me up as I was driving home to purchase this Eric Clapton piece. When I asked him where I should ship it, he told me the address: 461 Ocean Blvd!!!! That stopped me in my tracks. Anybody who knows Eric Clapton and his albums knows that the 461 Ocean Blvd. album is probably one of his best. The gentleman told me his family purchased Eric Clapton's house a few years back and have really enjoyed it. He purchased my Eric Clapton artwork because he felt that it was a really great representation of Eric and his work and it should stay with that home. This is why I love being an artist. I love having these experiences and meeting some amazing people. Everyone has a story to tell. Here's a piece of artwork I created for Scott Borchetta, owner of Big Machine Records. It was commissioned as thank you for his generosity at the Americarna Live fundraiser, which I also participated in this year. The license plate art highlights what Mr. Borchetta origins and passions. He's from California and lives in Tennessee. He's a big race fan so this piece pays tribute to the Dan Gurney Eagle, the Unser brothers and his Big Machine label group. I used the colors from the Johnny Lighting race car down the neck under his name because it is one of his favorites. The checked flag around the center hole represents his love of the Indy 500. I used Tennessee tags on the head stock. The right side keys are numbers from the Marty Robbins 777 race car. The left side keys are 24 for Jeff Gordon, and 98, which represents one of his own race trucks. The number 48 is Dan Gurney. I want to extend a special thanks to the Americarna people for commissioning me to make this piece. It's definitely one of my favorites. When you want to say something special with a gift, custom license plate art is the way to go. I create custom gifts that reflect what is special about the recipient on your gift list. They represent who they are, what makes them unique, and tells that story. It's the type of gift you want to give to someone special - even if that special someone is you. Here's my most recent example. This custom license plate art was created for a client who is an Alabama alum and was looking for a unique piece of artwork. I used vintage Alabama license plates to create this handcrafted license plate artwork. I think you will agree that this one of a kind a gift will light up any room. What room would you put it in? What story do you want to tell through custom license plate art?